“The growth of the B2B commercial channel shows how channel-based sales continue to be an increasingly valuable asset to the commercial IT market,” - Michael Diamond, Director, Industry Analysis, Commercial Technology, The NPD Group. For the fourth consecutive year, U.S. business-to-business (B2B) commercial channel revenue increased. Sales in 2015 grew 2.1 percent to more than $72 billion, according to The NPD Group’s Distributor and Reseller Tracking Services. 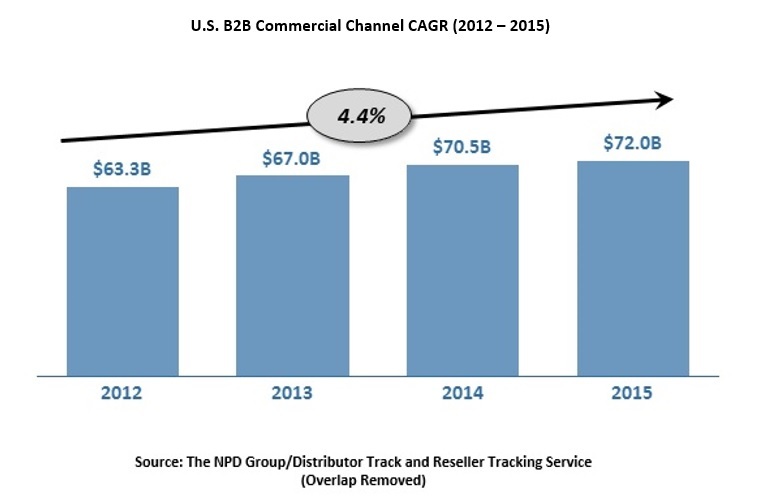 From 2012 to 2015, the U.S. B2B commercial channel market increased at a 4.4 percent compound annual growth rate, adding $8.7 billion in revenue over that period.